Good news is finally good news. Stocks rallied Friday after the latest employment report showed a second consecutive month of solid jobs gains and a pickup in wages. The Dow popped more than 175 points. The Nasdaq rose 1% and moved closer to its first new all-time high since July 2015. Investors cheered the solid jobs numbers -- even though it increases the chances of an interest rate hike by the Federal Reserve in September -- because it shows the U.S. economy remains on solid footing, despite concerns about Brexit and slowing growth in China. 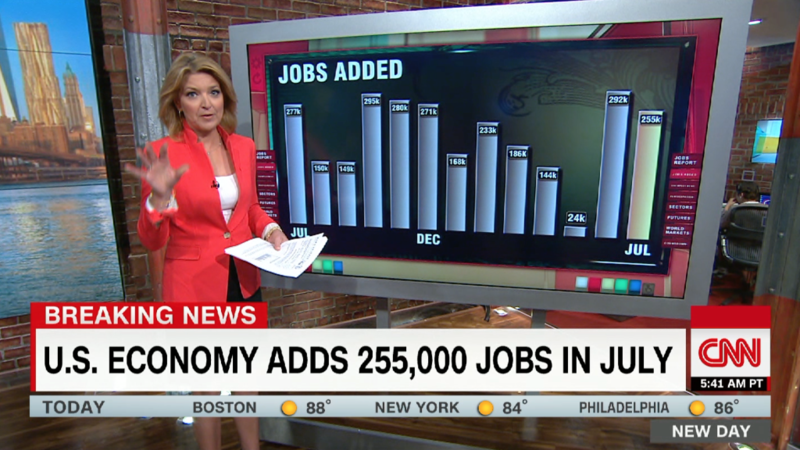 "There is nothing on the surface of the jobs report that looks weak." said Patrick Kaser, a large cap portfolio manager at Brandywine Global. Kaser said the jobs report is particularly good news for banks, which have had to cope with low interest rates hurting their profit margins for years. If the Fed does raise rates again in a few months, bank earnings should benefit. With that in mind, big bank stocks JPMorgan Chase (JPM), Citigroup (C), Wells Fargo (WFC) and Bank of America (BAC) all rallied on Friday. "It's a happy jobs day." said Andrew Chamberlain, chief economist for recruitment company Glassdoor. "Slow and steady growth is what we're seeing. It's good for banks and for the overall market." Bond yields rose as well, another sign that investors believe the U.S. economy is improving and that the Fed may raise rates at least once this year. But that could be bad news for some slow growth companies that investors mostly love for their high dividend yields. Verizon (VZ) is a prime example. It was one of only three Dow stocks that was lower on Friday morning. But shares of companies in highly cyclical industries were rallying, such as tech, retail and industrials. Companies like Apple (AAPL), Facebook (FB), Amazon (AMZN), Target (TGT) and Caterpillar (CAT) were all helping to push the market higher. Michael Arone, chief investment strategist at State Street Global Advisors, said investors are making the bet that the overall economy, which has continued to grow at a sluggish pace, might finally show more signs of life due to the brighter jobs picture. One of the few negatives in the report? Tim Hopper, chief economist at TIAA Global Asset Management, said annual wage growth of 2.6% is still subpar. And another measure of unemployment, the so-called underemployment rate, ticked a bit higher last month too. The continued decline of America's oil industry is also a problem. The government said that 6,000 jobs were lost in what they refer to as "mining" last month. There have now been 220,000 energy jobs lost since oil prices last were above $100 in September 2014. "This is another stomach punch to oil workers." Glassdoor's Chamberlain said. To that end, big oil stocks Exxon Mobil (XOM) and Chevron (CVX) were the other two Dow components in the red Friday. But as awful as it has been for people working at energy companies for the past two years, there is no denying that things are finally starting to improve in almost every other part of the job market. "The main message is the economy is showing momentum. A good labor market is pulling people back in to the workforce," said Vincent Reinhart, chief economist at Standish, a subsidiary of BNY Mellon. "Investors are reacting appropriately to the sustained economic stability." That's why Wall Street is happy. Even short-term focused investors realize that a solid economy is needed for a healthy market. The magic of Fed stimulus can only work for so long. "Consumers should continue to spend. That's good for the economy and earnings growth," said Kate Warne, chief investment strategist with Edward Jones. "After almost three weeks of the market being flat, stocks should now move higher. We were in a wait and see mode. In a slow summer, it's nice to have some good news where investors can go away for the weekend and not worry," she added.